Most of the matters are present in electrically neutral state in nature. To understand this, let us recall the basics of atomic structure. An atom is made up of electrons, protons and neutrons. An electron carries a negative charge, a proton carries a positive charge and there is no charge on a proton. In an electrically neutral atom, the number of electrons is equal to the number of protons. Thus, the equal numbers of negative and positive charges balance each other. Most of the matters remain in electrically neutral state because of this reason. Transfer of Charge: When certain objects are rubbed against another object, electrons may get transferred from one object to another. If an object loses some electron, it is left with surplus number of protons. Thus, this object becomes positively charged. If an object gains electrons, it now has surplus number of electrons. Thus, this object becomes negatively charged. The transfer of charges is responsible for static electricity in various objects. Static electricity is the main reason of lightning. A charged object attracts an uncharged object: Take a ball pen refill and rub it against a woolen cloth. Bring this refill near bits of paper. It is observed that the refill attracts the bits of paper. This activity shows that a charged object attracts uncharged object. Take a comb and rub it vigorously in your hairs. Your hairs should be completely dry during this activity. Bring this comb near bits of paper. It is observed that the refill attracts the bits of paper. This activity shows that a charged object attracts uncharged object. Like charges repel each other: Take two plastic balls and suspend them near each other. Rub a glass rod to induce charge in it. Touch both the balls with this glass rod. It is observed that the plastic balls move away from each other. This activity shows that like charges repel each other. Unlike charges attract each other: Take two plastic balls and suspend them near each other. Rub a glass rod with a silk cloth. Touch one of the balls with the glass rod and touch another ball with the silk cloth. It is observed that both the balls move towards each other. This activity shows that unlike charges attract each other. Electroscope is a simple device which is used to test the presence of charge in an object. The gold-leaf electroscope was developed in 1787 by a British scientist named Abraham Bennet. Gold and silver are among the best conductors of electric current and hence leaves of these metals are used in electroscope. 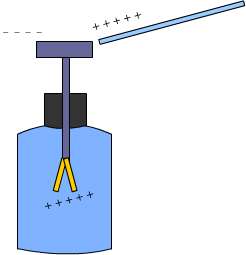 Structure of Electroscope: It is made of a glass jar. A vertical brass rod is inserted into the jar through a cork. The top of the brass rod has a horizontal brass rod or a brass disc. Two gold leaves are suspended from the brass rod; inside the jar. Working of Electroscope: When the brass disc of the electroscope is touched with a charged object, electric charge gets transferred to the gold leaf through the rod. This results in the gold leaves moving away from each other. This happens because both the leaves have similar charges. Charging: Transfer of charge from one object to another is called charging. In case of the gold leaves; charge is transferred through the brass rods. Hence, it can be said that charging can happen through metals. Electrical Discharge: In the above activity, the gold leaves resume their normal position after some time. This happens because they lose their charge. This process is called electrical discharge. The gold leaves would also be discharged when someone touches the brass rod with bare hands. In that case, the charge is transferred to the earth through the human body. Earthing: The process of transfer of charge to the earth is called earthing.